Enjoy these printable fact family and number bond worksheets to show the relationship between multiplication and division. 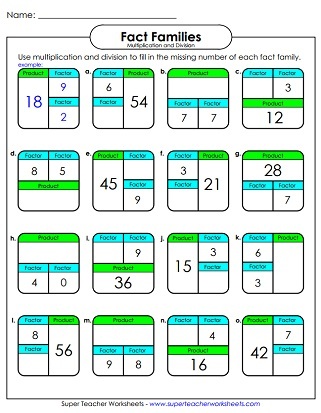 Here's a complete set of triangular multiplication and division fact family flashcards. Complete the multiplication-division fact family triangles. Another page of multiplication-division fact family triangles. Write the correct set of fact family problems in each house. 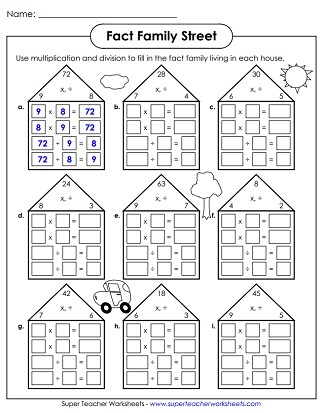 Another worksheet with fact family houses to complete. Use multiplication or division to figure out the missing number in each factor-factor-product box. Includes facts for 0 - 9. Another worksheet with factor-factor-product boxes for students to solve. Includes facts for 0 - 12. Complete these multiplication and division number families. Includes basic facts for up to 9. 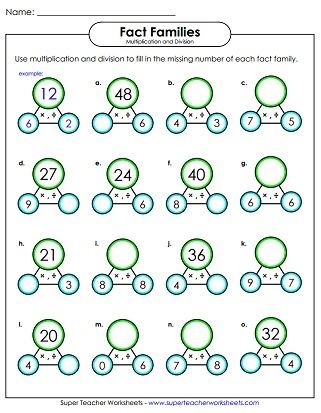 Complete these multiplication and division number families. Includes facts for 0 - 12. Write a fact family for each array shown.